The field of art conservation is constantly evolving, thanks in no small part to ever-advancing technology that allows for greater, more detailed analysis of paintings. Using advanced imaging techniques, conservators can not only determine what a painting might have looked like when it was first completed, they can also use software to reconstruct the original and give fresh new perspectives on revered pieces. In a recent conservation effort at the Art Institute of Chicago, a new analysis method uncovered a striking revelation in a Renoir that drastically alters one’s perception of the painting. The piece, Madame Léon Clapisson, is a famous portrait by the renowned French Impressionist Pierre-Auguste Renoir. Completed in 1883, the 131-year-old painting was recently removed from its frame by the conservators at the Art Institute of Chicago, where it resides. They found that the part of the painting behind the frame was substantially brighter and more vivid, especially with regard to one particular pigment. The pigment, an amalgamation of pink, orange, and red, was carmine lake, which is made from crushed cochineal insects that can be found on cactuses in Mexico and South America. Because carmine lake is an organic pigment, it is unable to be detected by traditional imaging techniques such as infrared and ultraviolet imaging. However, after finding this perfectly preserved pigment beneath the frame, the conservators used a new laser technique known as surface-enhanced Raman spectroscopy. There are no plans to restore the painting to its original color, but it’s fascinating to see the new life that conservation efforts can breathe into art. Photographs of the painting can be seen here and here. 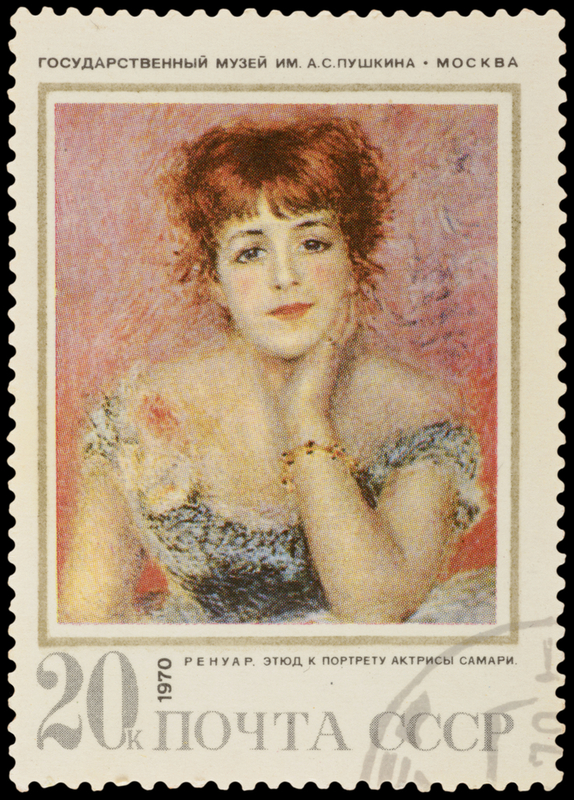 Below is Renoir’s Portrait of the Actress Jeanne Samary on a commemorative postage stamp. This entry was posted on Friday, June 27th, 2014	at 5:58 pm	and is filed under Art News	. Both comments and pings are currently closed.